Federal Title & Escrow Company increases security protocols and transaction ease by implementing ZOCCAM® to allow real estate agents to send earnest money and the contract directly to the title company without having to drive. “Our partnership with ZOCCAM, the platform that utilizes a mobile app to deposit escrow money anytime from anywhere, will save our clients time and provide peace of mind, knowing the transaction is safe and secure. 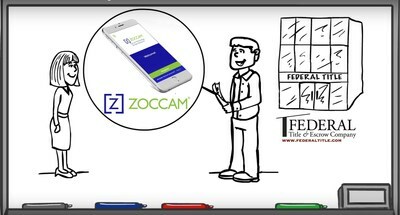 ZOCCAM replaces the physical need to deliver the check by enabling the delivery with the simple touch of a button. Federal Title & Escrow Company is proud to partner with ZOCCAM to enhance our title services to the Washington metropolitan real estate industry,” said Joe Gentile, President of Federal Title and Escrow Company. “It’s not surprising that Federal Title & Escrow Company recognizes the value of innovative technology. I look forward to their partnership,” said Ashley Cook, CEO of ZOCCAM.